Clinic Synopsis: Most band directors are trained in college how to teach each instrument from a beginner level. What is missing is how to recruit, how to close the communication gap between students, parents, and administrators, and what to do before students get into their book. 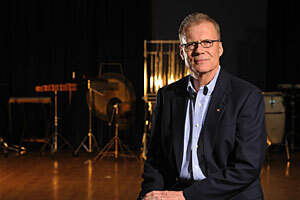 Clinician Biographical Information David Willson is in his twenty-first year as director of bands at The University of Mississippi. He also served as a band director in the public schools of Mississippi for sixteen years. In 1989, he was voted the "Most Outstanding Band Director" in Mississippi, and in 2005, received the "First Award" for his service to students. In 2007, he was named "Teacher of the Year," and in 2010, was honored by Phi Beta Mu International Bandmasters Fraternity with the "Outstanding Contribution to Bands" Award. Professor Willson is also past-president of the Mississippi Bandmasters Association and Phi Beta Mu International Bandmasters Fraternity. His publications include, "Starting Beginner Band Students" and "Band Calisthenics," which are used extensively throughout the southeast United States. Willson is also active as a clinician, speaker, and adjudicator nationally.